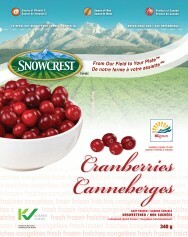 Cranberries - 340 g - Snowcrest Foods Ltd.
Snowcrest’s round, red Cranberries are tart and flavourful. These glossy, ruby red jewels are the perfect addition to your favorite muffin, stuffing or cranberry sauce recipe. Their complex, bittersweet flavour makes them a seasonal favorite. They are loaded with Vitamin-C and are grown in British Columbia – harvested and frozen at the “Peak of Perfection”™. Antioxidant compounds in cranberries such as oligomeric proanthocyanidins (OPC’s), anthocyanidin flavonoids, cyanidin, peonidin and quercetin may prevent cardiovascular disease by counteracting against cholesterol plaque formation in the heart and blood vessels. 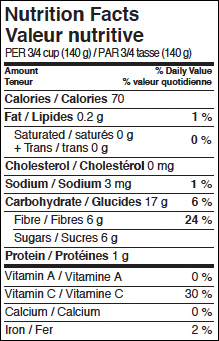 Further, these compounds help body lower LDL cholesterol levels and increase HDL-good cholesterol levels in the blood. Research studies shows that cranberry juice consumption offers protection against gram-negative bacterial infections such as E.coli in the urinary system by inhibiting bacterial attachment to the bladder and urethra. Consumption of cranberries makes urine acidic. This, along with the bacterial anti-adhesion property of cranberry juice helps prevent formation of alkaline (calcium ammonium phosphate) stones in the urinary tract by working against proteus bacterial infections. Further, the berries prevent plaque formation on the tooth surface by interfering with the ability of another gram-negative bacteria, Streptococcus mutans, to sticking on the surface. It thus helps prevent development of cavities in a way similar to the action in preventing urinary tract infections. The berries are also good source of many vitamins like vitamin C, vitamin A, ß-carotene, lutein-zeaxanthin and folate and minerals like potassium, and manganese. Oxygen Radical Absorbance Capacity or ORAC (measurement of antioxidant strength of food items) designates cranberry with an ORAC score of 9,584 units per 100 g, one of the highest in edible fruits.